This year I have been able to start getting more done in not only my blog and business but also in my life. One of the best tools I have found to get more done is using the Pomedoro Technique. The Pomodoro Technique is a time management technique that was developed in the 1980’s. I just discovered it in the beginning of this year and am loving it. By becoming super focused on only one task I am more productive and actually accomplish the things I set out to do. I am still in the process of learning how to be the most productive that I can be and finding out what works best for me and as I keep discovering new techniques and tricks I am going to share them with you readers on my blog and on social media. Since I love the topic of productivity so much I put together a free email course all about it. Click the image below and sign up for free. There are many out there that you can use on your phone or devices. I have tried a few and my personal favorite is Pomotodo.com. The way that this site is set up just worked best for me. Although the main timer aspect is similar among many Pomodoro apps. So test them out and then pick what works for you. Just search Pomodoro or Pomodoro timer on your computer or device and you will be shown tons of options. 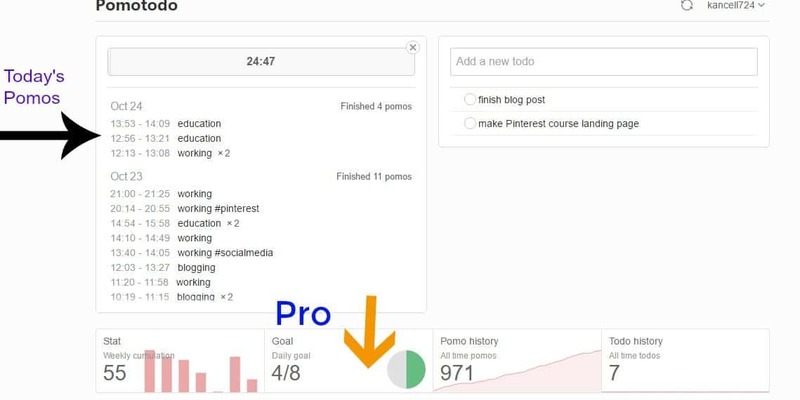 The main things that I get with pro that is a big benefit are the Pomo Goal and the Work Report. I like to get my weekly email so that I can see just how I did that week. Here is a snapshot of an email report that I receive. It lets me know how me Pomodoros I achieved that week and if I hit my goal. Also if I’m more productive than the week before. I have been for a few weeks so I’m changing my goal to 10 Pomodoros a day. I usually do that many but I hadn’t changed the goal since I began using the app. Updated 9/2017: I started using a new app to track my Pomodoros. I still like using the Pomodoro technique but my old app wasn’t working with my new phone so I found one that does. I know use Be Focused pro to monitor my Pomodoros and what tasks I’m working on during them. That way I can see how many Pomodoros I did during the week on blog posts, using Pinterest, product creation and more. Another factor in me getting more done and accomplished is making daily to-do lists. I’ve been using Evernote to make my goals for each month and week. Then making a daily to-do list to get those goals accomplished. I still make my big to-do list with Evernote. On that list, I put all the things I want to get done that day including appointments and errands. Then I use the to do section of the Pomotodo app to put the top two blog or business-related things I want to get done or work on that day. That way when I’m using my Pomodoro app I am constantly being reminded of what my main objectives and goals for the day are. I just started using the to do list on the app and I find it to be very helpful. I hope that this post has helped you realize why using the Pomedoro Technique to get more done will help you. I want to know that it is a simple technique that helps you to use your time more productively so you can accomplish more. So get out there and find an app for your phone, device or computer. I have Pomotodo on everything and that way no matter what I’m using or where I’m at I can keep track of what I’m doing. I’ve never heard of this technique, but it sounds really interesting! I might just have to give it a try. I love this technique. I use the SLOTH app and this is basically the same thing. It has helped me become soon much more productive. It sets and alarm and at the end of the period you switch to another task or take a break. Love this! Thanks! Sounds like a great method! Super interesting and seems effective!